shall burn thereupon the fat of the peace offerings. This is the perpetual fire which shall never go out on the altar." The light of fire, penetrating darkness, is a symbol for the Trinity and for the grace or Person of Christ, in particular. He is "the Light of the world," as St. John tells us, and "in Him there is no darkness." While the light of fire illumines, the heat of it warms us -- and purifies. 1 Corinthians 3:13-15 tells us that fire will reveal and try our works, burning up the traces of those that can't enter Heaven (Revelation 21:27). This fire of God's love, baptizing us, illuminating, warming, and purging us, manifested before Moses in the burning bush and at the Pentecost when tongues of flame appeared over the Apostles' heads. It is in part because of the obvious symbolism grounded in these accounts that candles and lamps have been used in Christian liturgy from the beginning. Their use, though, isn't only symbolic; it is rooted thousands of years ago in the Old Testament. The tabernacle lamp is usually a light that hangs down from the ceiling, encased in a red globe. It is often called a "sanctuary lamp" because, barring extraordinary circumstances, such as in an historic cathedral with lots of tourist traffic, the tabernacle is to be kept near the Altar, in a prominent, honored, and well-decorated place, in the sanctuary. Thou shalt make also a candlestick of beaten work of the finest gold, the shaft thereof, and the branches, the cups, and the bowls, and the lilies going forth from it. Six branches shall come out of the sides, three out of the one side, and three out of the other. Three cups as it were nuts to every branch, and a bowl withal, and a lily; and three cups, likewise of the fashion of nuts in the other branch, and a bowl withal, and a lily. Such shall be the work of the six branches, that are to come out from the shaft: And in the candlestick itself shall be four cups in the manner of a nut, and at every one, bowls and lilies. Bowls under two branches in three places, which together make six coming forth out of one shaft. And both the bowls and the branches shall be of the same beaten work of the purest gold. Thou shalt make also seven lamps, and shalt set them upon the candlestick, to give light over against. The snuffers also and where the snuffings shall be put out, shall be made of the purest gold. The whole weight of the candlestick with all the furniture thereof shall be a talent of the purest gold. Look and make it according to the pattern, that was shewn thee in the mount. According to Ivo of Chartres, the wax, which is formed from the juice of flowers by the bee, always considered as the emblem of virginity, signifies the virginal flesh of the Divine Infant, who diminished not, either by His conception or His birth, the spotless purity of His Blessed Mother. The same holy bishop would have us see, in the flame of our Candle, a symbol of Jesus who came to enlighten our darkness. St. Anselm, Archbishop of Canterbury, speaking on the same mystery, bids us consider three things in the blessed Candle: the wax, the wick, and the flame. The wax, he says, which is the production of the virginal bee, is the Flesh of our Lord; the wick, which is within, is His Soul; the flame, which burns on top, is His divinity. For this reason, candles are to be lit on the Altar during The Mass. Then, after the candle is lit in the new fire, it is carried into the darkened Church, showing us how the risen Christ is the source of all light and hope. It remains near the Altar throughout the days of Easter, until Ascension Thursday. Thereafter, it is lit only for Baptisms and funerals, showing us the link between His Resurrection and our hope for eternal life through death to sin in Baptism, and resurrection after physical death. The small Baptismal candles given to new Catholics, who are generally received at Easter time, are lit from this Paschal candle symbol of Christ's Body, Soul, and Divinity, lit from the new fire, on the day of His resurrection. These Baptismal candles should be kept and used, if possible, in one's wedding, Unction, and funeral. The candles blessed at Candlemas are used during Sick Calls, Unction , funerals (if Baptismal candles aren't available for these purposes), during storms and tempests (when prayers are especially directed to St. Barbara), and after sunset on All Saints' Day for private devotions during which we pray for our dead in anticipation of All Souls Day. 3 February is the Feast of St. Blaise, a day on which we are blessed through prayer and the holding of two crossed candles against our throats. When you enter a Catholic church, you might see a shrine, small side chapels or side altars with statues or icons and rows of votive candles. The word "votive" comes from the Latin "votum" meaning "vow," and these candles (which aren't blessed) are, when lit, used to symbolize our prayers, vows of prayer, or simply our honoring God or one of His Saints. They are lit by the people outside of Mass (before or after, or during simple visits to a church) -- usually for a specific intention. 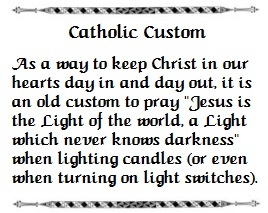 It's a very Catholic thing to say to someone that you will "light a candle for them," meaning that you will pray for them and ritually symbolize those prayers by the lighting of votives. It's not uncommon, too, to find these intentions written out and placed near the candles. Another common reason to light votive candles is out of gratitude to God for answered prayers. We light the candle while praying for our intention or offering our thanks and then leave the flame burning as signs of our prayers. You might see a little coin box or basket nearby for donations to pay for the candles. If you're truly poor, don't worry about it! But if you are able, it is right to drop in a dollar or two to offset the costs. A good prayer to pray when lighting votive candles: “O Lord, may I be present in this candle, which consumes itself before you.” It's a lovely way of expressing the sentiment of St. John the Baptist, who said, "He must increase, but I must decrease" (John 3:30). Catholic families make use of votive candles at home, too, especially at family altars and, of course, during the Advent and Christmas Seasons with their respective Candles, and in the Easter Season, with its white candle symbolizing the Light of Christ ("Lumen Christi"). To get wax out of votive candle holders: Pour 1/8" of tap water in the base of the votive holder prior to lighting. Once the votive candle is extinguished, allow the wax to solidify. Once solid, gently push on the wax and the contents should pop loose. If that doesn't do it, put the container in the freezer for about 15 minutes. Take out and press on wax a little, it should pop out. To clean up spilled wax: Off of cloth and carpets: Let spilled wax solidify so when it hardens it can be removed in pieces. Then get what is stuck by covering with folded paper towel or a brown paper grocery bag and lay a warm -- not too hot -- iron on top, without moving the iron around which would spread the wax around). The wax will melt and be absorbed into the paper. If it is on your carpet, and your carpet can withstand rubbing alcohol on it without losing any color, pour a little alcohol over any candle stain and brush with a stiff brush. For candle wax on wood, hold your hair dryer over it until it melts, then wipe away with a paper towel. Follow up with a mild water and white vinegar solution. For your family altar, you might want to get candle holders in various colors to match the liturgical seasons -- Purple for Advent, White or Amber (gold) for Christmastide, Green for Epiphany, Purple for Septuagesima and Lent, White or Amber for Eastertide, and Green again for Time After Pentecost. Or, to save money, you can use clear candle holders and tie ribbons around them that match the Seasons' liturgical colors. Large bonfires are built to symbolize the Light of Christ on Holy Saturday after the Vigil Mass (or during if for those who don't go to Mass that evening), and to symbolize St. John the Baptist on the Eve of his Feast (23 June), a day that falls near the Summer Equinox (see painting at the top of this page). Jesus called John "a burning and a shining light" (John 5:35), so the fires symbolize this Saint perfectly. If you live in a relatively temperate zone, it is good to build fires on the Feast of St. Brigid (1 February, Candlemas Eve), too, as St. Brigid is another Saint associated with fire. After her death in Kildare, her Sisters kept a fire burning in an enclosure near the convent. This fire burned from A.D. 525 to A.D. 1200, and was relit to burn for another 400 years until the Protestant "Reformation." 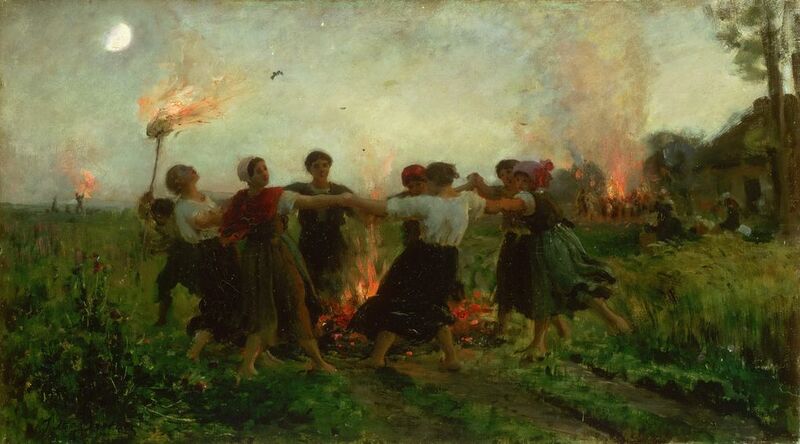 Bonfires are also often lit on Walpurgisnacht (the Eve of 1 May), All Saints' Eve (31 October), at Martinmas (11 November), and on the Feast of St. Lucy (13 December).